The history of treating malaria with herbal and other plant-derived compounds stretches back centuries. In modern times, some of these remedies have been proven to contain potent chemical compounds for fighting malaria, and have been developed into a pharmaceutical arsenal of treatments. However, in the last half century, the war has turned more into an arms race. The malaria parasite – and in particular, Plasmodium falciparum, the most deadly species – been able to evolve resistance to several medications frequently used to treat the disease. While strains resistant to one form of treatment or another are now widespread, scientists have noted that the Mekong Region has frequently been the source of these new, drug-resistant strains. This region may therefore become a critical front in the on-going battle to reduce malaria incidence, as well as provide much-needed lessons learned for how to prevent resistance from evolving in other regions of the world. 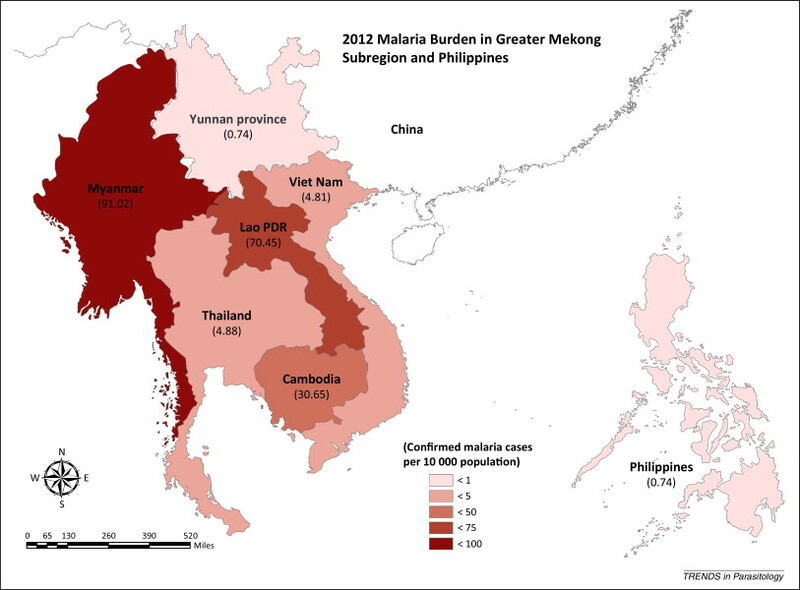 Malaria burden in Greater Mekong subregion and the Philippines in 2012. Taken from Manning et al (2014) in Trends in Parasitology (doi:10.1016/j.pt.2014.10.002). While malaria is still a significant health problem in the Mekong Region, the burden of the disease is far less than in some other parts of the world. Indeed, the Mekong Roll Back Malaria initiative, launched in the late 1990s, has succeeded in reducing the number of annual deaths due to malaria in the region by more than 60%. Even though elimination is still some ways off, with incidence still high in Myanmar/Burma and Laos in particular (see figure below), it remains somewhat counterintuitive that this region of the world, and not others with far higher rates of malaria infection, would constitute the epicenter of antimalarial resistance. To date, strains of malaria have evolved to be resistant to four of the most common treatments, and each time, research has shown that the resistant strains first appeared in the Mekong. Chloroquine resistance first emerged in Thailand in 1957 and then spread rapidly around the world. Taken from Packard (2014) in NEJM (DOI: 10.1056/NEJMp1403340), with data from WWARN (www.wwarn.org). First up was chloroquine. Chloroquine was first discovered in the 1930s, but it only became widespread as an antimalarial treatment more than a decade later. By 1957, strains of Plasmodium falciparum had been detected in Thailand; the selective pressure on the parasite was strong, so the genes for resistance (it was later discovered that only four mutations were required to change P. falciparum from a susceptible strain into a resistant strain) spread rapidly. Chloroquine resistance also evolved independently on other continents, notably in South America. By the 1980s, chloroquine resistance was ubiquitous in sub-Saharan Africa (see map below), resulting in a sharp increase in the number of malaria deaths, especially among children. New antimalarials were desperately needed, and, luckily, some were soon available. Thailand introduced a new compound, called sulfadoxine-pyrimethamine (SP for short) as its primary first-line treatment against malaria in 1973. By 1980, the cure rate had dropped to under 25%, indicating that the parasite had already managed to evolve resistance to this new drug. As with chloroquine, these resistant strains spread rapidly, and also emerged independently in other regions. By this time, the U.S. military had developed yet another antimalarial compound, known as mefloquine (often sold in as Lariam). To boost SP’s efficacy, in 1985 mefloquine was added in a fixed dose to SP, as a combination therapy to treat malaria. Again, it took less than a decade for P. falciparum to adapt; by 1992, cure rates significantly dropped again. Again, the center for the emergence of resistance was the Mekong Region. Not far to the north, and in parallel to U.S. efforts to develop new malaria drugs, Chinese scientists had been working throughout the 1960s and 1970s on their own efforts to create antimalarial compounds. They eventually extracted a compound, called artemisinin, from a plant called sweet wormwood (Artemisia annua) – a tea brewed from this shrub has been used for at least 2,000 years as a traditional Chinese remedy for fevers. Artemisinin proved to be extremely effective at treating malaria, especially when used in combination with other antimalarial compounds; these combination pharmaceuticals, known as artemisinin-based combination therapies (ACTs), are recommended by the World Health Organization (WHO) as front-line treatment for all uncomplicated cases of malaria, and have become a stalwart of control programs throughout the world. The red dots show areas where artemisinin-based combined therapies (ACTs) have failed due to increasing artemisinin resistance in local Plasmodium falciparum malaria. Credit: Mahidol Oxford, via the Cambodian Times. Perhaps inevitably, the unique ecology, human migration patterns, and microbial melting pot of the Mekong Region struck again. 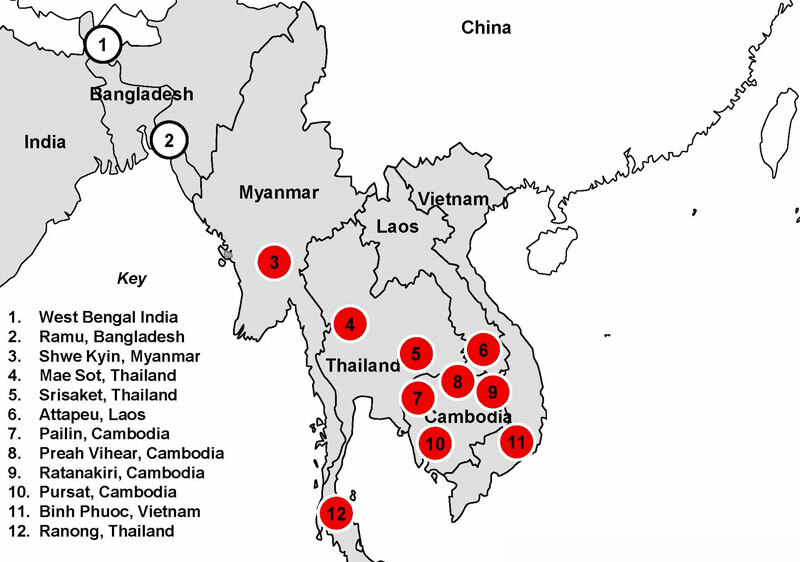 In the mid-2000s, clinical evidence for artemisinin resistance was reported from Cambodia. Over the following few years, more reports streamed in, confirming artemisinin resistance from Thailand, Vietnam, and Myanmar (see figure below). Given the world’s reliance on ACTs, this is sobering news; the WHO has noted that if resistance to artemisinin were to spread to countries with large populations at risk of malaria, such as India, the results in terms of increased morbidity and mortality could be catastrophic. Strengthen regional oversight and support. Other efforts, such as the Worldwide Antimalarial Resistance Network (WWARN; wwarn.org) also closely monitor clinical and research data, keeping particular scrutiny on the Mekong. In the absence of new antimalarial drugs, we must do our utmost to ensure that the ones we have do not fall further victim to the evolution of resistance.